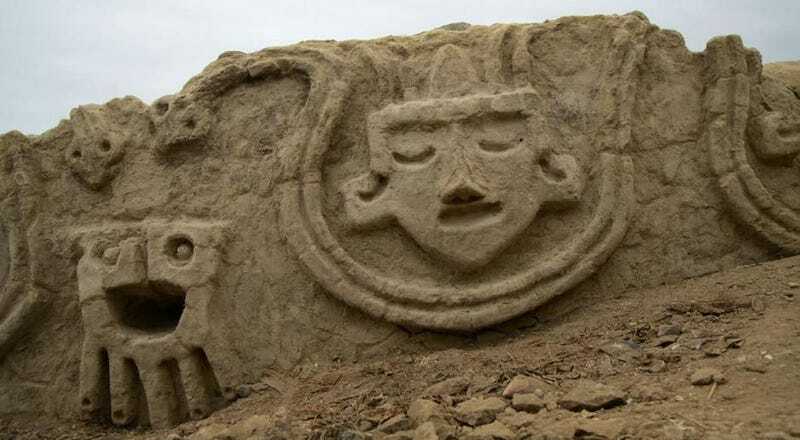 Archaeologists in Peru have uncovered an ancient wall relief dating back to the Caral civilisation – the oldest known civilisation in the New World. Though whimsical in appearance, these ancient symbols held very serious meaning. The delightful wall relief was discovered by an Archaeological Zone Caral (ZAC) team at the Vichama archaeological complex in Supe Valley, about 112 miles (180 km) north of Lima, Peru, as reported in Deutsche Welle. Dating back to the Late Archaic Period of the Central Andes, this site was once home to the Caral civilisation, also known as the Norte Chico civilisation, which is considered the oldest known civilization in the Americas. At its peak, an estimated 3,000 people lived in this complex, which contained plazas, dwellings, and a large temple. Excavations at Vichama began in 2007, and archaeologists have been uncovering artefacts ever since. The wall, made from adobe, measures three feet (one metre) in height and nine feet (three meters) in length. Archaeologist Ruth Shady Solís, the director of excavations at Vichama, says the wall once formed the antechamber of a public building and it faced towards the agricultural fields of the Huara Valley, according to the Latin American Herald Tribune. This ancient building included stepped windows and a sunken circular plaza, encompassing an area around 9,400 square feet (875 square meters). In all, some 22 buildings have been located within the Vichna complex, which was built between 1800 to 1500 BC. The wall relief depicts four human heads with eyes closed. Two snakes surround them, leading to a fifth, central, non-human head that’s thought to represent an anthropomorphic, or humanoid, seed symbol. With mouth open, the seed seems to be digging into, or sprouting from, the soil. The wall relief may symbolise a period of drought and famine, as other reliefs found nearby depict emaciated humans. “The reliefs symbolise the fertilisation of the earth: snakes represent the deity, linked to water, which filters into the earth and makes the seed germinate,” explained Shady Solís in TeleSur. “The new relief reinforces the approach of capturing, in the collective memory, the difficulties faced by society due to climate change and water scarcity, which caused serious effects on agricultural productivity,” said Shady Solís.